On Monday 8th October we toured Fingringhoe Wick Nature Reserve on the look out for Bats and Badgers. 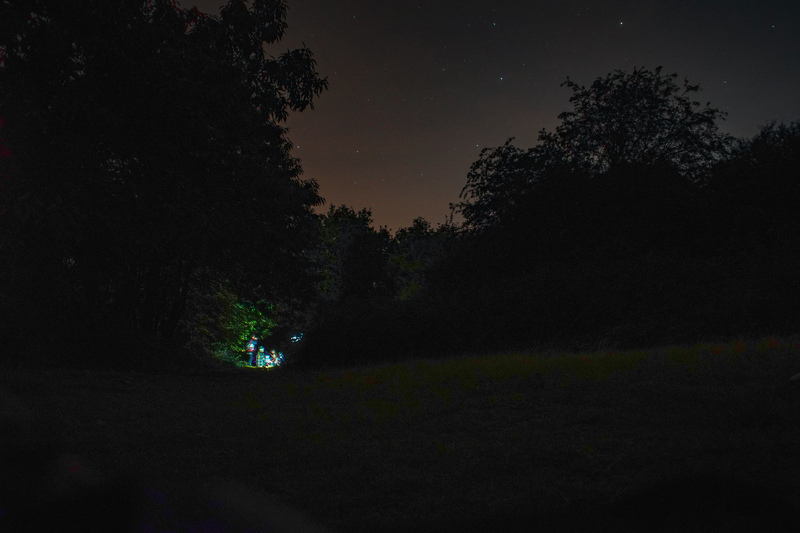 With the nights drawing in, we explored Fingringhoe Wick Nature Reserve under cover of darkness and to discover what comes out when the sun goes in – and importantly what noise it makes. For this is the second episode of our seasonal podcast from the nature reserve, we were joined for the evening by young peoples music ensemble CLIP who took the opportunity to have an outdoor jam session in the dark! Young peoples music ensemble CLIP performing outdoors undercover of darkness. Using field recordings and interviews at the nature reserve we’ve put together this short podcast, following the members of CLIP around the reserve as they discovered the evening soundtrack of the reserve. We began the evening in the Meles Meles badger hide, with volunteer Tom Turnbull who was a fountain of knowledge for the reserves cete of badgers. After waiting patiently for 30minutes the badgers slowly began to appear, munching on the peanuts Tom had left out for them. Nana, nana, nana, nana, BAT WALK! Unfortunately, the bats didn’t compete with the badgers for numbers. Although their lack of appearance certainly made the group more adamant to find one – and therefore even more excited when we eventually did (as you can hear in the podcast). The bat we heard was probably a Pipistrelle, the most common species in the UK and whom live in colonies of 1,000 or more. With a wingspan of 22cm and a body length of just 35mm, the Pipistrelle often roost in modern houses, but are found roosting and foraging everywhere. Want to be the first to hear about more free workshops?